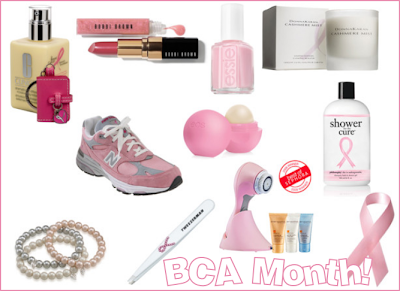 Before this year, this month meant something to me because my great aunt died from breast cancer years ago. Fast forward to this year and my mother-in-law has been diagnosed (in the early stage...thank goodness) and is currently undergoing treatment. Luckily with time, treatments and knowledge have really progressed. With this being the month that breast cancer is in the spotlight, many companies come out with charitable products. You still get the awesome product you want and part of the proceeds go to the cause. It's a win-win situation for everyone. Here's a list of a few things I've found! Please think of donating in some way, rather by buying dedicated items or just straight-up donations. Breast cancer affects 1 in 8 women. It's already affected two wonderful women in my family. No one is immune, so remember to do self exams along with professional ones. Get to know your body! Love your post, hope your mother-in-law will be ok!